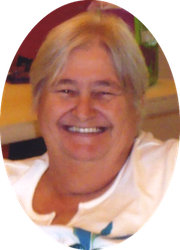 Margaret Ann Rollinson, 68, passed away Tuesday, January 15, 2019 at her home in Dahlgren, Illinois. She was born in Jefferson County, Illinois on November 4, 1950 to Ernest and Lena Pearl (McKiney) Murphy. She was a home maker and of the Baptist faith. Margaret is survived by her lifetime partner, Clyde “Bob” Rollinson of Dahlgren, IL; one son, Robert Rollinson of Indianapolis, IN; three daughters: Janie (Charles) Butler of Centralia, IL, Martha (Robert) Glass of Derby, England and Rachel Mooney of Denver, CO; six grandchildren: Maggie Hunt of Sesser, IL, Amy (Richard) Werner of Mt. Vernon, IL, Eddie Butler of Centralia, IL, Julia Glass of Birmingham, England, Xavies Mooney of Denver, CO and Dameon Brown Jr. of Denver, CO; and one sister, Brenda Tuggle of Mt. Vernon, IL. Three great grandchildren also survive. She was preceded in death by her parents, mother-in-law, several cousins and one sister, Linda Murphy. A memorial funeral service will be held Monday, January 21, 2019 at 7:30 p.m. at the Gholson Funeral Home in Dahlgren. Visitation will be Monday, January 21, from 6 to 8 p.m. at the Gholson Funeral Home in Dahlgren. She will be laid to rest at Union Chapel Cemetery in Texico, IL.